While fumbling around Spotify for some wakeup music this morning, I stumbled upon all three of the sampler covers I did for Polyvinyl Records. These were great little projects to work on with one of my favorite record labels. Here is how they happened. In the 90's the Trocadero was the best venue in Philadelphia to see a rock show. At least it was my favorite. I saw my first concert there, Pearl Jam, for 12 bucks, plus scores of other bands from the era like Alice In Chains, L7, Smashing Pumpkins, Shudder To Think, Quicksand, Rage Against the Machine, on and on. When I started making posters, the Troc was one of my main inspirations, and I managed to build a great relationship with the show booker there. He helped me land great posters for bands like Stereolab, Low, Calexico, Built To Spill, and Sleater Kinney. In 2006, a loose consortium of indie record labels hosted a conference at the Troc, and I got to make a duo of posters for the event (called Indies Only) that were handed out to attendees. Check em out. Matt Lunsford, founder and co-owner of Polyvinyl Records, was one of the attendees, with a couple of his bands playing the bill. He dug the posters I'd made and dropped me a line (Tip: put your URL or a legible signature on your work!). Polyvinyl at the time was doing annual label samplers, and he happened to be looking for art at the exact time that he found my work. Matt has good taste, not just in bands but also for design, and I'm not just tooting my own horn. Their releases always feature thoughtful, well executed design work, and the label's promo and design pieces have called on some great artists and designers (Jesse LeDoux, Andy Mueller, Chris Strong come to mind). So to be hired for these pieces was a delight. The first sampler had not much art direction other than a call to make it interesting to look at. I mixed drawings and ink washes with some found textures and patterns, landing on this odd portrait. A bit of free writing yielded the title, which they let me keep on there as well. 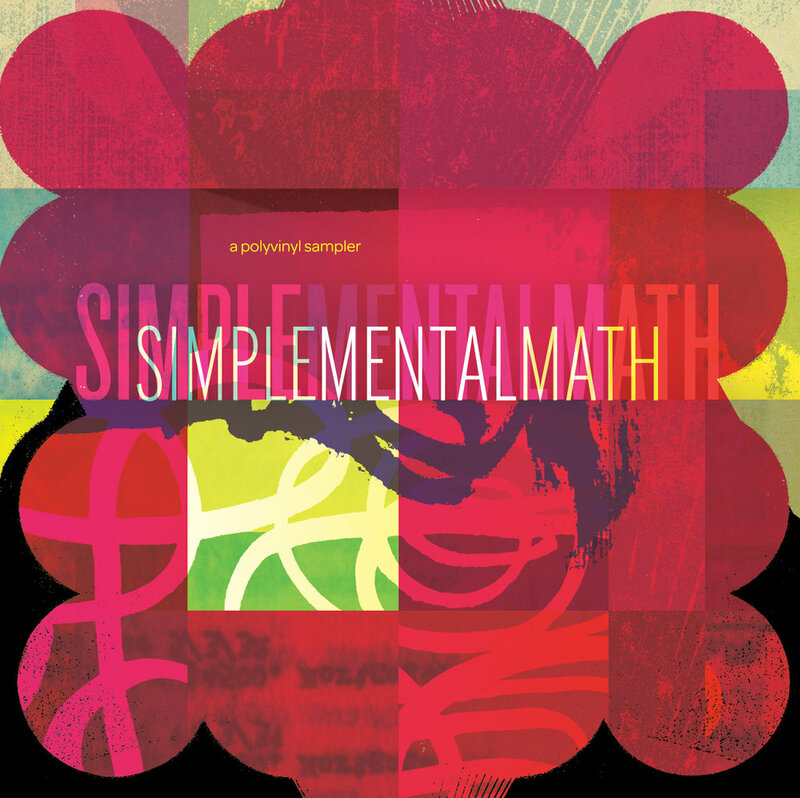 2006 was Polyvinyl's 10th year as a label, and to mark the occasion they held an anniversary concert, which we converted the sampler artwork to use as the concert poster. We kicked off 2007 with a tote bag design, featuring some fun ink-blot drawings. I preferred the full-drawing approach, but they wanted an all-over pattern on a black bag so zoomed and cropped. We took a similar route for the 2007 sampler, but Matt ended up giving me a title to work with. Some melodramatic killed titles included Navigator and Daring Escapes. 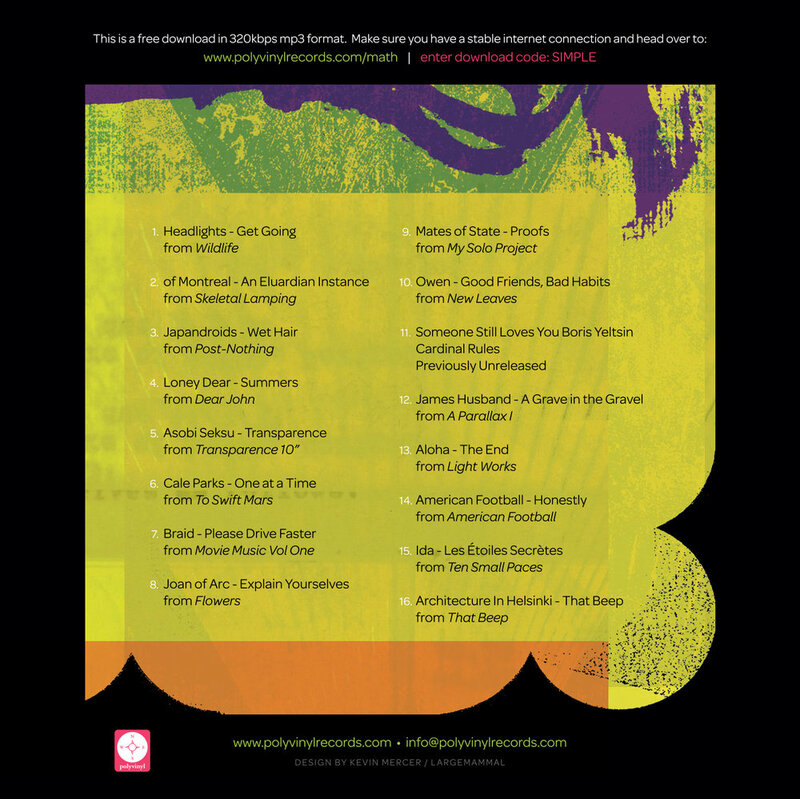 Polyvinyl came knocking again in 2009, this time for a digital download sampler and insert that would be packed with other releases. I got to design a landing page for the download card, carrying the aesthetic all the way through the campaign. These jobs were a pleasure to work on because I got to create my own imagery, put it into a design context, and see the whole thing through with a client who trusted my vision. It's been ten years since these projects, and it will be interesting to see where my creative path leads in the next decade! Since 2009 I have been working with Philly radio station WXPN on a great many projects, the centerpiece of which is their annual Xponential Music Festival. What began with an intrepid edition of posters led to entire campaigns of branding, collateral, advertising, product design and illustration. Here are a few highlights and details from last year's project, to give you an idea how it comes together. The project typically kicks off in January with some logo options. This year we weren't reinventing the wheel; the previous year's logo was pretty sharp and well-received. This will be an evolution of sorts, not a teardown-rebuild. My first round of proofs contains a quick look at the previous year's logo, some very rough ideas and a swipe of inspiration images and colors. This is just a conversation starter. As I mentioned, we decided at this point to do a refresh more than a complete redesign, so I put together another round of proofs that hit on that, with a couple side roads in for good measure. The client ended up liking 3B and 4B, and asked for another round of proofs to test out colors. We ended up landing on the final design below, which I then prepared for use in a number of formats and situations (CMYK, RGB, grayscale, Facebook profile, optimized for small and large placement). While the logo is still in process I am working on graphic treatments that will run throughout the campaign. This includes and textures, patterns, icons, imagery, and overall concepts that can tie the whole project together. An early request for a co-sponsored web ad yielded a direction that I would later refine into a simple treatment. Though the imagery is pretty raw, I've landed on some textures, colors, and stacked stripes that work well. This is about the same time when the t-shirt needs to get moving for an upcoming fund drive and the announcement of the headlining acts. The shirt design does not need to closely relate to the festival brand, which offers a nice opportunity to make something fun and engaging to wear. After two rejected options we hit pay dirt with this wacky bus illustration, something that the old hippies and young hipsters can agree on. Below is the initial illustration, and the design converted to two colors for screen printing. Because it develops in dribs and drabs over several months, a project like this requires some big picture thinking to maintain a cohesive look. The good news is that it's clear in my head, the client understands what I am shooting at, and they trust me to communicate their message. I'll follow up on the rest of the project in the next post. Just finished this site design for my pals at WXPN.